A quick start guide explaining the basics of how to use Material Editor and describing how revising parameters affects the build file you are producing. 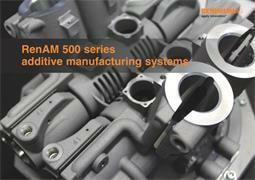 A brief brochure describing some of Renishaw's additive manufacturing capabilities. Global engineering company Renishaw is working with autonomous topology optimisation expert ParaMatters to introduce potential customers to efficiently manufacture metal parts. A data sheet from Renishaw's supplier of Hydra-Sol MAG additive used in AM when working with reactive materials such as aluminium or titanium.